We call it Jumba, you’ll call it home. Home isn’t just Jumba though, it’s our neighborhood; Cukurcuma, it’s our city; Istanbul, it’s all the places and people we love, all of this, to us, means home. It’s ours and yours. 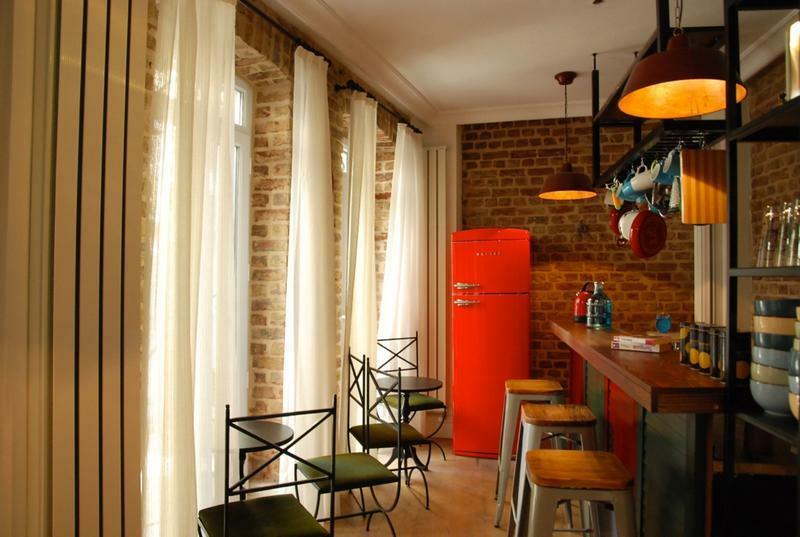 Jumba is a design hostel run by three sisters and you can take it for granted that it’s stylish, it’s chic and it’s cool. But we have no more pretentions than to take care of our guests, to get to know them, to treat them as friends, and last but not least to have fun. Here we have no employees, the three of us take care of all the work at the hostel, from cleaning to pub crawls, from breakfast to our special Jumba events. 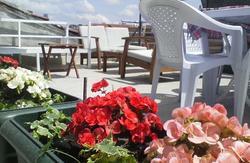 We provide spotless and stylish rooms, cozy common areas and precise recommendations about the city. Once you’re at Jumba, we don’t let you pay for anything… We offer free breakfast, tea & coffee all day, free towels, linens, Wi-Fi and sometimes even cooking parties. Book your rooms at Jumba and let us host you here! Alternative 1(~30 min. depending on traffic): Get in contact with us to get a private airport pickup service for a reasonable price. Alternative 2 (~ 45 mins. depending on traffic): Take Havatas Shuttle Bus from the airport to Taksim Square. When you get off at Taksim Square which is the last stop, go to İstiklal Street, which is the most famous street in Istanbul with many shops and bars. Walk down İstiklal street until you see Galatasaray High School with a huge green gate on your left. Take the first left turn onto “Yeni Çarşı Street” and make the first left again to “Hayriye Street” which is Jumba’s street. 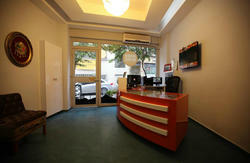 On Hayriye Street you need to walk 100 meters until you see Jumba Hostel on your right hand side at number 22. Alternative 3 (~ 75 mins. ): Take the only metro line from the airport to “Zeytinburnu” station. At Zeytinburnu station switch to the tramline that goes to “Kabataş” direction. Get off the tram at Tophane station. You will see a big mosque near the station. Across the mosque there is a street called Boğazkesen going up the hill towards İstiklal Street. After walking on Boğazkesen street around 300 meters you we will see a taxi station on your left and “Bostanci Başı Street” on the right. Take a right turn on Bostanci Başı street. Walk until the end of Bostanci Başı where the road takes a left turn and ends at “Hayriye Street”. When you make that left turn onto Hayriye Street, Jumba Hostel is the second building on the left, number 22. Alternative 1(~60 min. depending on traffic): Get in contact with us to get a private airport pickup service for a reasonable price. Alternative 2 (~ 90 mins. depending on traffic): Take Havatas Shuttle Bus from the airport to Taksim Square. When you get off at Taksim Square which is the last stop, go to İstiklal Street which is the most famous street in Istanbul, with many shops and bars. Walk down İstiklal street until you see Galatasaray High School with a huge green gate on your left. Take the first left turn onto “Yeni Çarşı Street” and make the first left again onto “Hayriye Street” which is Jumba’s street. On Hayriye Street you need to walk 100 meters until you see Jumba Hostel on your right hand side at number 22. Alternative 1 (~ 20 mins. ): From Sirkeci Train Station take the tramline that goes towards “Kabataş”. Get off the tram at Tophane station. You will see a big mosque near the station. Across the mosque there is a street called Boğazkesen going up the hill towards İstiklal Street. After walking on Boğazkesen street around 300 meters you we will see a taxi station on your left and “Bostanci Başı Street” on the right. Take a right turn on Bostanci Başı street. Walk till the end of Bostanci Başı where the road takes a left turn and ends at “Hayriye Street”. When you make that left turn onto Hayriye Street, Jumba Hostel is the second building on your left, number 22. Alternative 2 (~ 10 mins. ): Take a taxi from Sirkeci Train Station to our hostel. It shouldn’t cost more than 15 Turkish Lira. Alternative 1 (~ 60 mins. ): From the coach station take bus line 83-O (Otogar - Taksim) to Taksim Square which is the last stop. When you get off at Taksim Square which is the last stop, go to İstiklal Street which is the most famous street in Istanbul. with many shops and bars. Walk down İstiklal street until you see Galatasaray High School with a huge green gate on your left. Take the first left turn onto “Yeni Çarşı Street” and take the first left again onto “Hayriye Street” which is Jumba’s street. 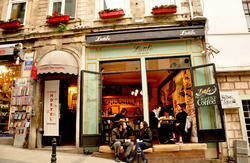 On Hayriye Street you need to walk 100 meters until you see Jumba Hostel on your right hand side at number 22.